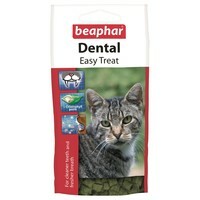 Beaphar Dental Easy Treats for Cats 35g is a tasty treat that helps to fight bad breath while strengthening teeth. Containing a rich source of the natural plant extract chlorophyll, renowned for its ability to absorb nasty odours, these delicious treats strengthen your cat’s teeth to help make them stronger against plaque. Bursting with flavour, your cat will be more than happy to have a few!